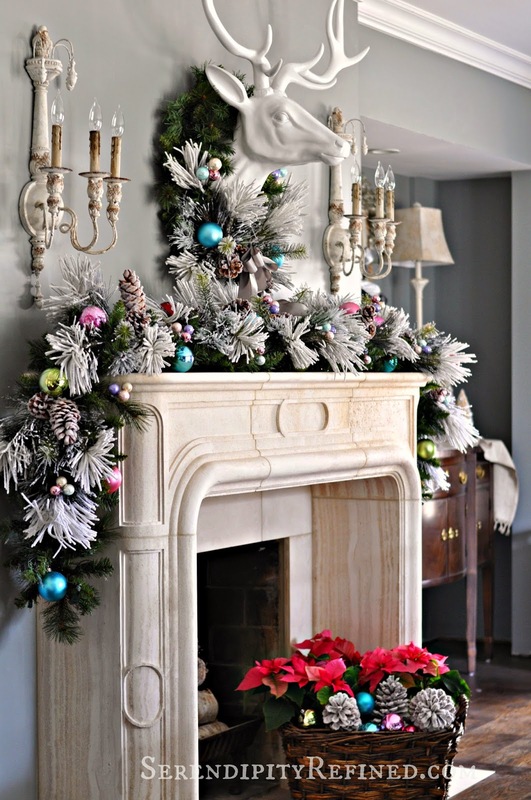 Believe it or not, there was one year that I didn't finish decorating until Christmas eve! 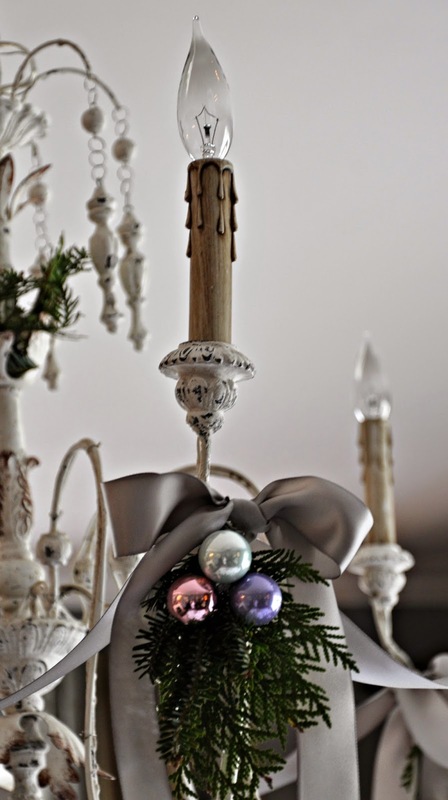 This year, I dept the decor to a minimum. 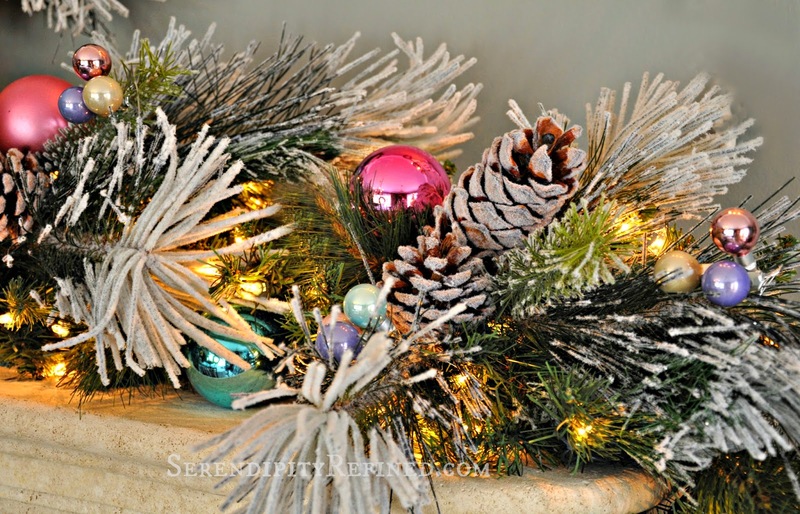 The mantel has garland which I made thicker by adding flocked branches and pine cones along with a few round ornaments. 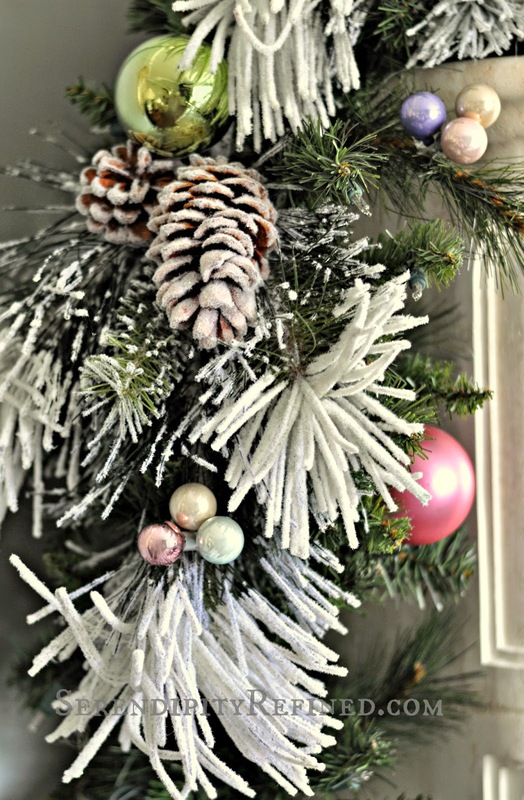 You may remember the flocked branches from last year's rustic ski lodge mantel. 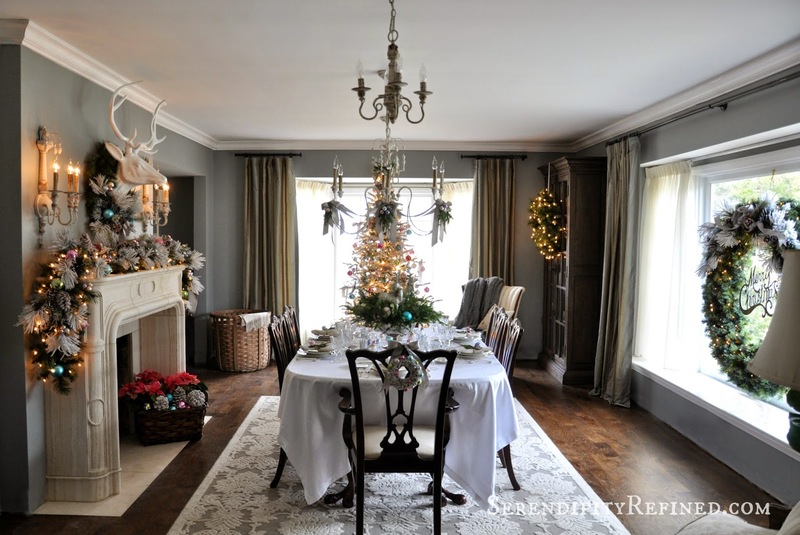 The same is true for the tree in this room, it was in the living room of our last home for Jennifer Rizzo's 2012 Christmas Home Tour. 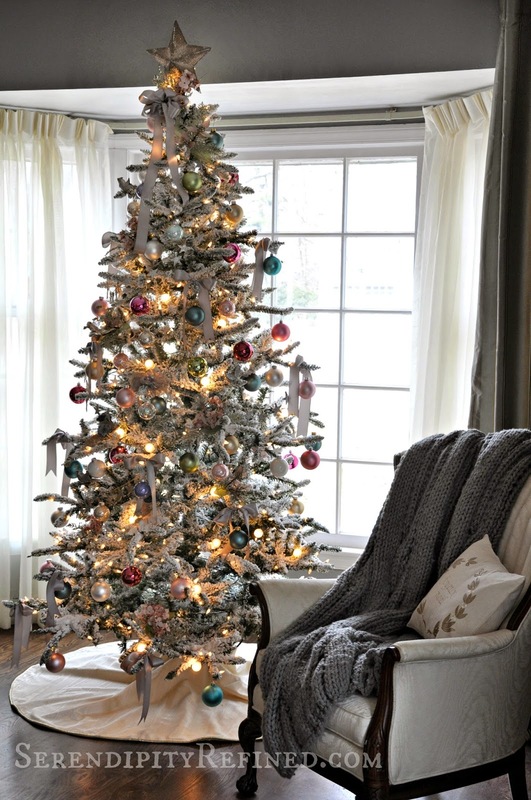 This year, the tree is dressed in pale gray satin ribbon and a collection of pastel ball ornaments. 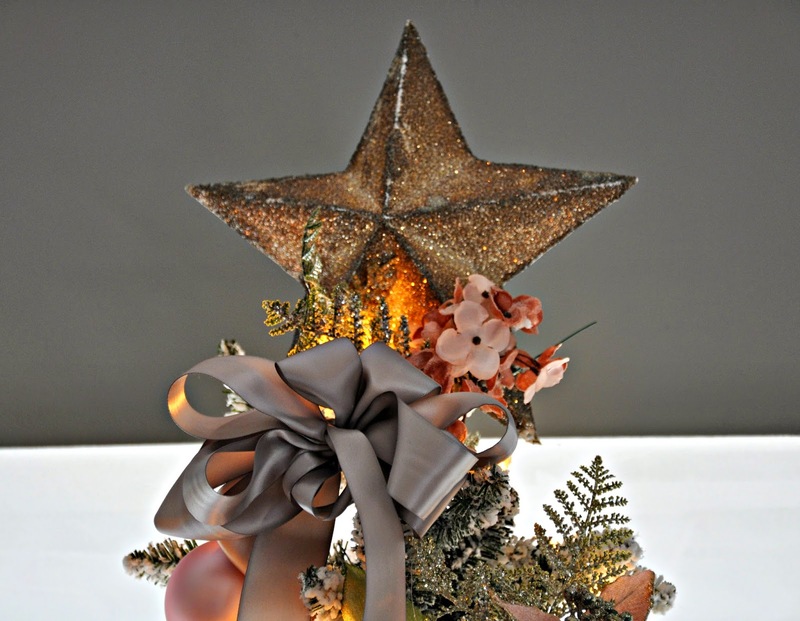 I added a few sprigs of pink and blue flowers and some glittered star garland. 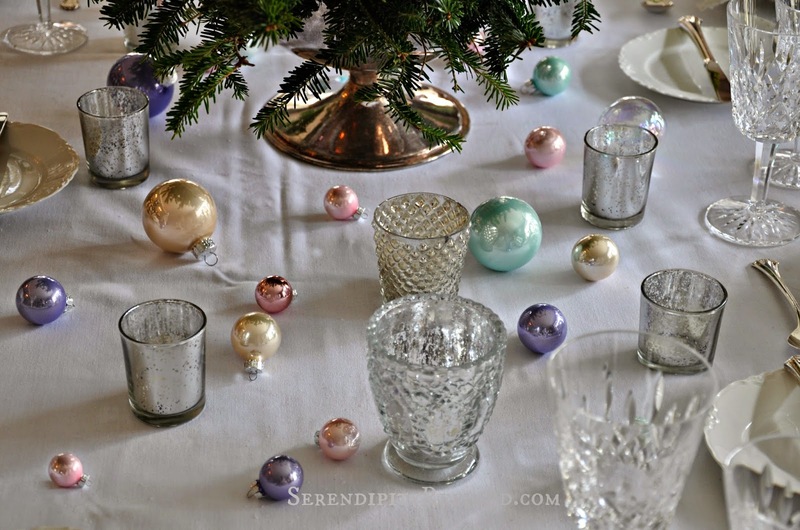 My favorite is the vintage German glass glitter star at the top. 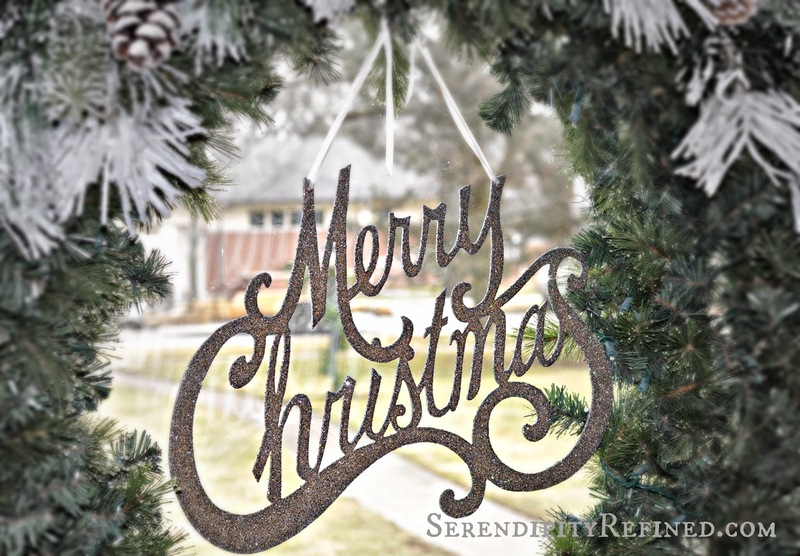 I love the patina that comes with age and I find that having a few pieces like this mixed in gives my home a sense of history. 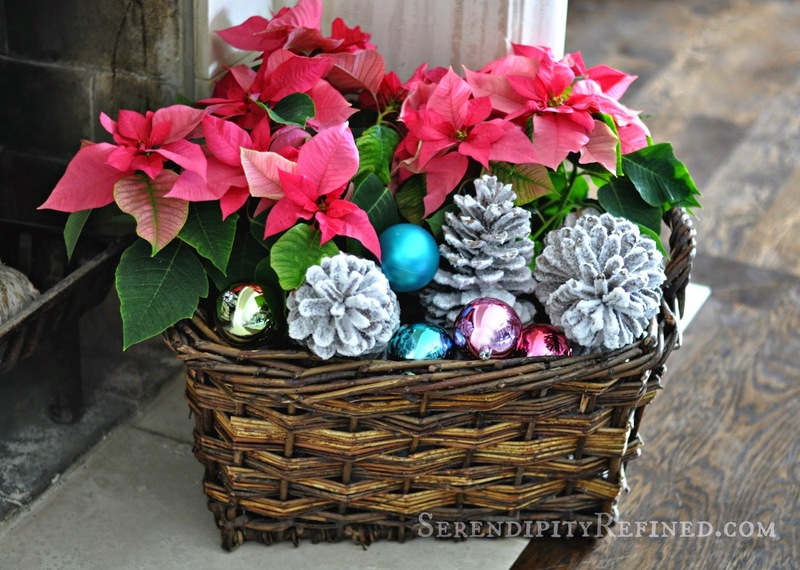 A simple wicker basket on the hearth filled with poinsettias, pine cones and a few ornaments makes a nice focal point for just a few dollars. 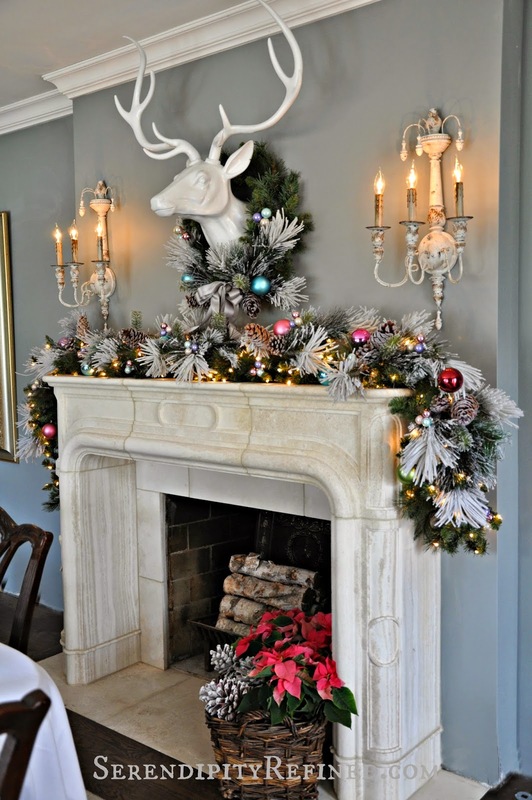 Besides, when you've got a gargantuan white stag head above your fireplace, do you really need anything else? 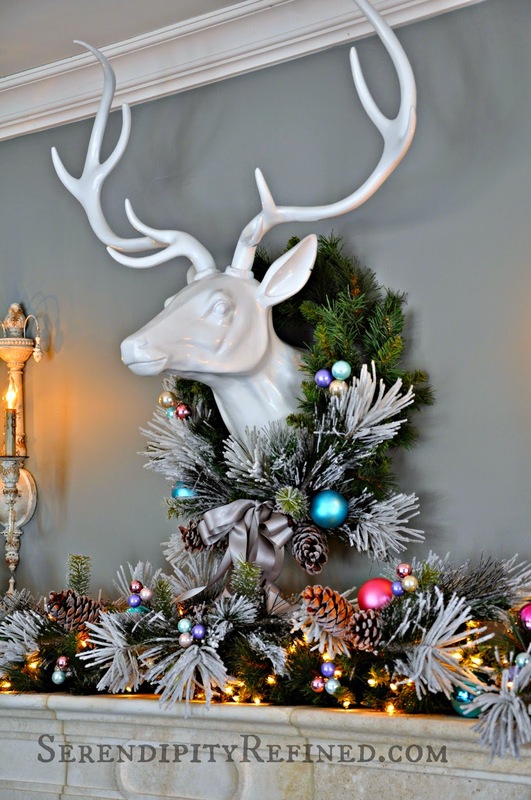 He's new this year and, at the suggestion of my friend Linda, I've named him "John"...yep..."Deer John"....sorry, sometimes I can't resist. 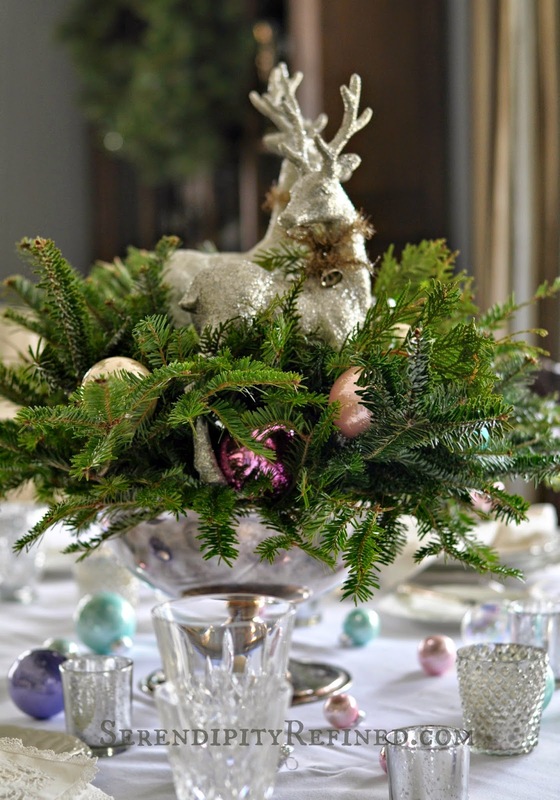 I put a few houses which were in our woodland dining room in 2012 on the sideboard. 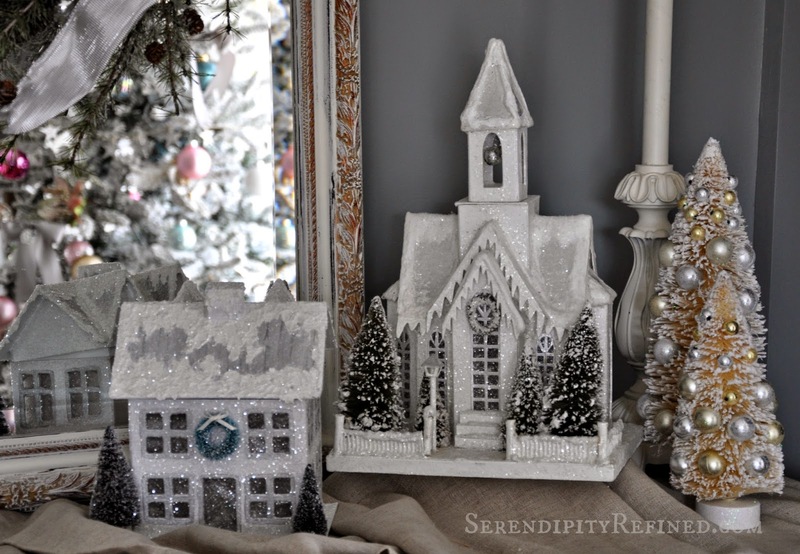 The church was purchased but I made the house from a cardboard one that I found at the craft store. 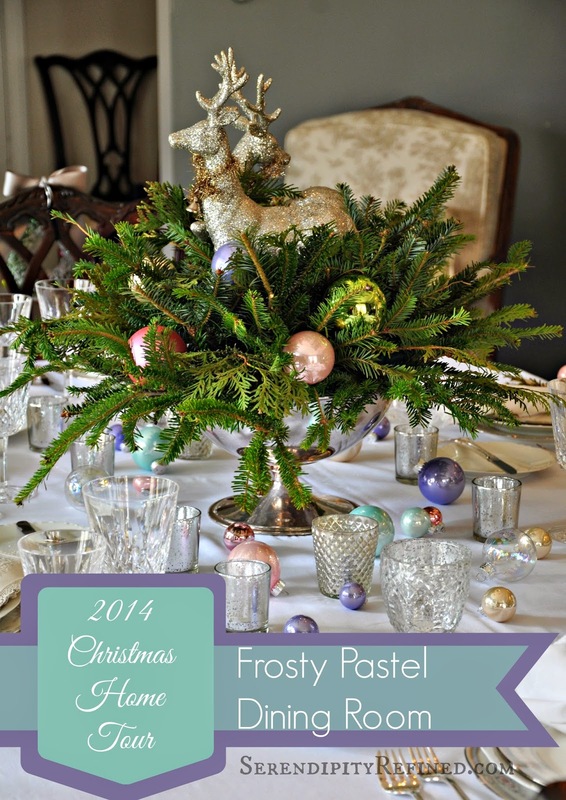 The table is a combination of pastels and mercury glass. 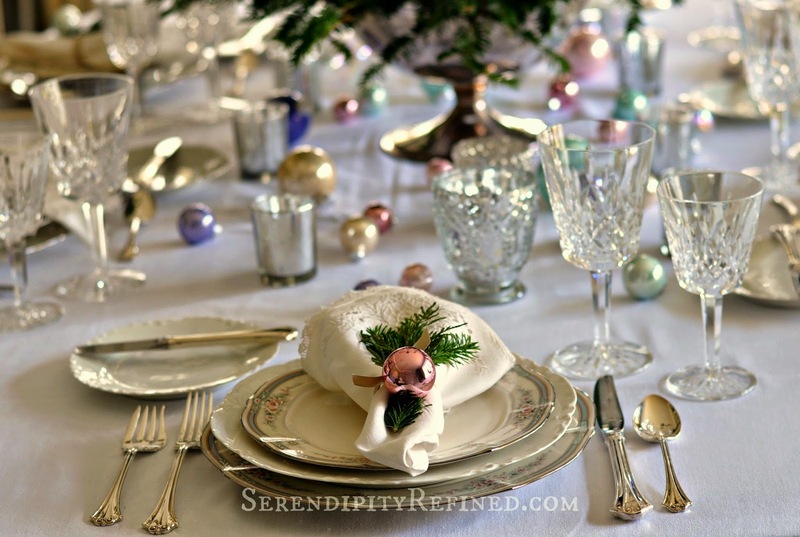 French porcelain mixes with my wedding china for a softer, less "matchy" look. 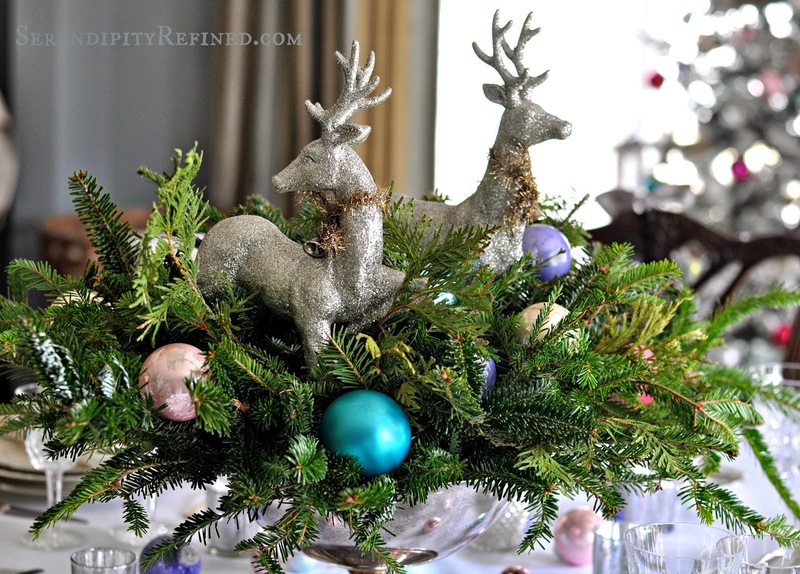 The centerpiece is a silver punch bowl which I filled with evergreen branches, ornaments and a pair of vintage deer. 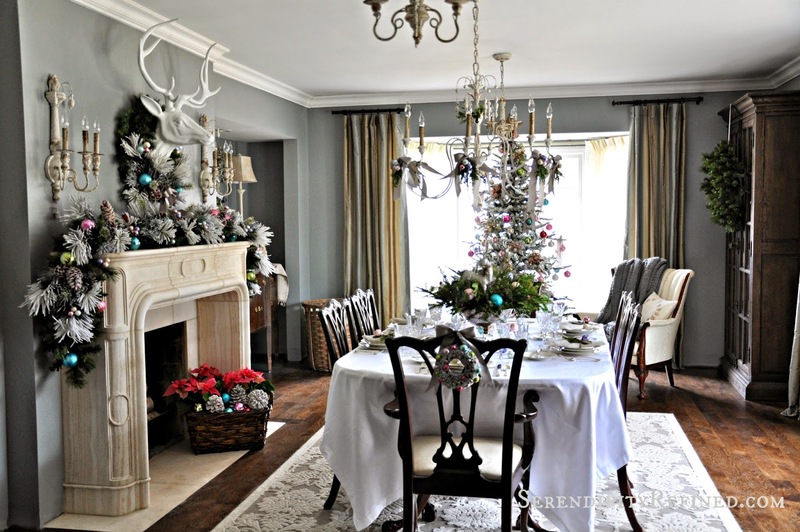 There are wreaths on the cabinets, the backs of the head chairs at the table, and in the bay window, tied with the same gray ribbon that adorns the chandelier. 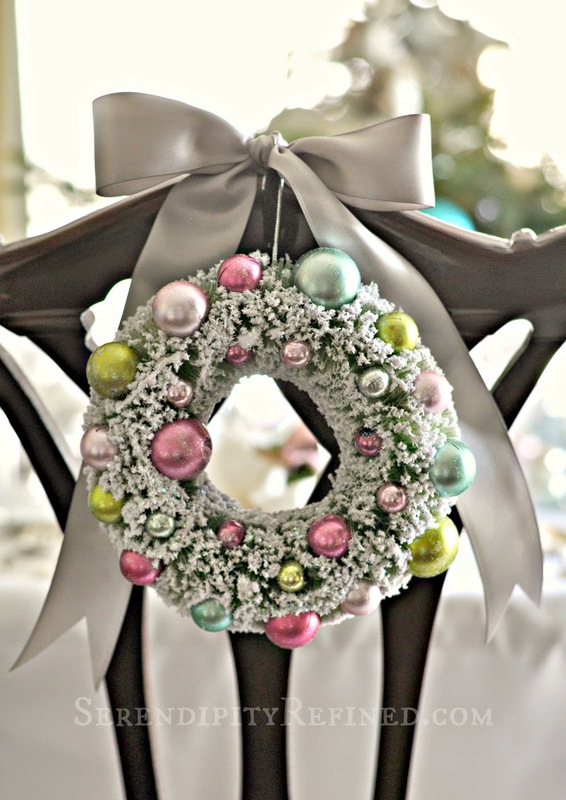 I love the way the colors look against the white...sparkling in the first sunshine that we've seen in over a week.